It was so good in fact that I’d go so far as to say that this franchise has become my favorite since Nolan’s ‘Batman’ films. This is why the easiest way for me to describe how this compares to the first film is to say that ‘Dawn’ is to ‘Rise’ as ‘The Dark Knight’ was to ‘Batman Begins’. ‘Rise’, like ‘Begins’, was an exceptional origins tale; but it was a story that felt rushed or overshadowed in place for the development and establishment of only the central character. ‘Rise’ still had an emotional resonance, and the final twenty minutes are incredibly thrilling, but it ultimately felt incomplete. With ‘Dawn’, like with ‘The Dark Knight’, the film makers were free to use what was already established with their new hero to tell a much more complete, more complex and emotional story on a much grander scale. 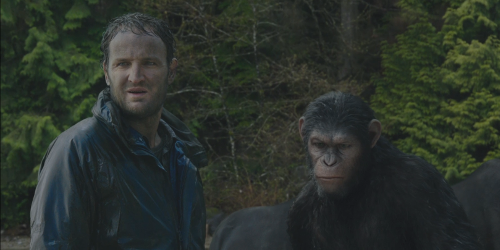 ‘Dawn of the Planet of the Apes’ takes place ten years after the events of the first film. The world has been devastated by the Simian Flu. Humans have spent the last decade fighting the virus and themselves. They live in a post-apocalyptic world, struggling to survive, but are making progress. Caesar (Andy Serkis) and his troop on the other hand have built themselves a community, a tranquil home in the Muir Woods that is thriving according to their needs. That peace is interrupted when a group of humans enter their territory. They are led by Malcolm (Jason Clarke), who is trying to find and fix a hydroelectric plant that could help bring power back to San Francisco. The actions of one in that group lead Caesar and his family to have little trust in their intentions, but allows them to proceed because they are clearly desperate. Caesar is one of the few apes that has seen the good in human’s and also knows cooperation could keep the peace. As the bond between human and ape grows there is still one among Caesar’s troop that does not believe that peace is possible. 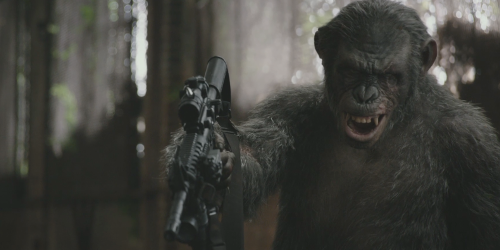 That ape is Koba (Toby Kebbell), who was beaten, tortured and used for medical testing his entire life. Koba’s distrust only grows when he learns that the humans, led by a man named Dreyfus (Gary Oldman), have access to military stock piles and are willing to take control of the area surrounding the dam by force if it were to become necessary. 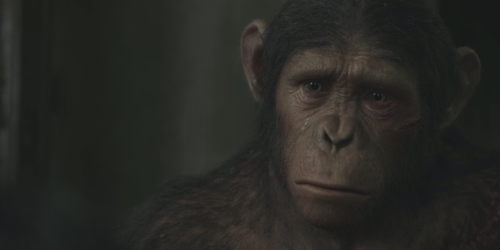 Thinking Caesar is weak and too loyal to humans, Koba decides to take it upon himself to protect the apes, and his actions set off a chain of events that could only lead to only one thing…war. When the film ended and I walked out of the theater I felt completely satisfied with what I had just seen. My expectations for the film were already incredibly high, but I would be lying if I said this didn’t actually exceed them. What makes the film such a resounding success for me is the way in which the story puts everyone on equal grounds. There are no true villains here, and even those that assume that role do so for reasons that were easy for me to empathize with. Dreyfus may want to kill the apes, but he does so because he is a man who has lost everyone he ever loved and will do anything to protect the remaining humans that have put their trust in him. Koba, as selfish as some of his actions may be, is someone who was physically and mentally abused his entire life. His revenge might seem cruel, but one could hardly blame him for wanting it. Everyone is fighting for the survival of those that they love and the homes they established. I couldn’t help but want everyone to succeed. Unfortunately, as the story progresses, it becomes clear that the pain and damage under the surface of both man and ape make the idea of peace between the two impossible. Some differences are irreparable. There is definitely an allegory here of war that reflects current and past conflicts. Luckily those themes of warfare, family and survival are all expressed effortlessly through the actions of its characters. It manages to be intelligent and complex without being thematically overbearing, while maintaing an intanacy. That is mainly because the film is handled with exceptional craftsmanship by Matt Reeves. The direction and cinematography, especially within Caesar’s settlement, is wonderful. It is never flashy, and is often much darker and moodier than one might expect. The editing and pacing is near perfect, which is rarely the case with these sorts of films. It only ever slows when it needs to, but the story is always moving forward. Every scene matters, even the quieter moments, for which there are many; again, something one might not expect, especially given the action heavy trailers. The score is perhaps the best Michael Giacchino has done since ‘Up’, adding to the moody atmosphere, and I LOVED his little nob to ‘2001: A Space Odyssey’ in the opening sequence. Everything here is done with purpose and execution of it all is nearly flawless. Lastly, I would be remiss to end this review without mentioning the performances, which were the soul of the film. Even with the way everything else was handled, I am not sure ‘Dawn of the Planet of the Apes’ would have worked without these specific performances. The human cast of Clarke, Oldman and Russell were all fantastic. The film’s only real flaw was that there actually wasn’t enough focus on them. I understand that the heart of the story is Caesar and his apes, but the human characters could easily have been developed more. Still, what development and emotional connection we did get was due mainly because of the actors portraying them. They make us care for these people, making the inevitable conflict even harder to bear as the film approached its climax. The motion capture for the apes was mind blowing. Andy Serkis is in a class of his own. The visuals and animation here are some of the best I think I have seen; but it is the emotion and talent of the actors behind all that CGI that makes those ape characters feel so real. Serkis plays Caesar as someone filled with grief and the weight of the responsibility of caring for his troop bleeds through. Toby Kebbell plays Koba with a ferociousness that is equally terrifying and mesmerizing; and I also really loved Nick Thurston, who played Caesar’s eldest son Blue Eyes, and how he managed to expressed so much in just his gaze. I mentioned early in this review how this film compares on some level to ‘The Dark Knight’ for me. That film was speculated to be in the run for an Oscar nomination for Best Picture but it never happened. The backlash was so strong that some think it was the reason the Academy increased the number of films that could be nominated. I truly hope that Serkis will receive some form of recognition for his work here; and if not, I hope all of us praising him so greatly now will be vocal enough when the time come that maybe the Academy will make another change to who and what it nominates. I am not sure where I would place this film among others I have seen in 2014 but I know I’d put it somewhere near the top. This isn’t just another intelligent summer blockbuster; it is really an exceptionally crafted epic, a thrilling action-drama with an emotional and thematic resonance that future films should make a note of. 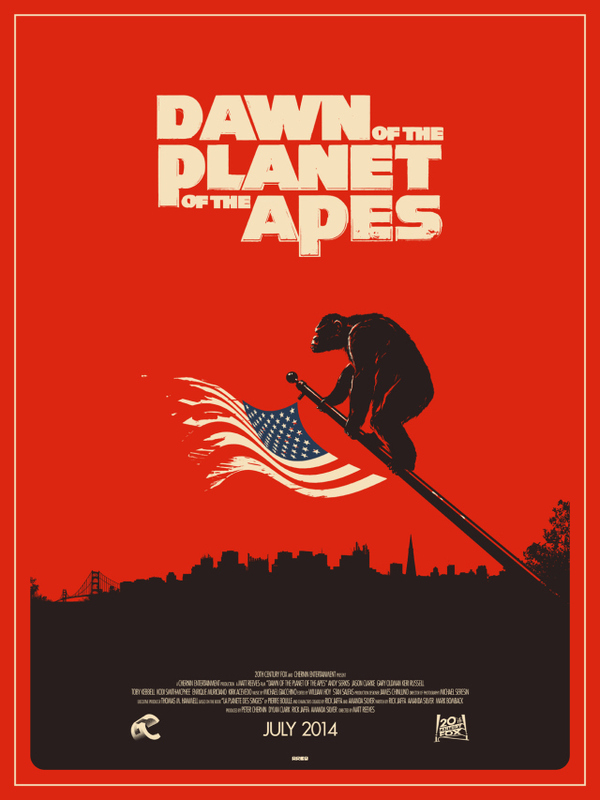 And, as I felt when I first watched ‘Rise of the Planet of the Apes’, I eagerly await the next installment – which will thankfully be directed again by Matt Reeves. This entry was posted in Film, Film Review and tagged Andy Serkis, Apes, Batman Begins, Blue Eyes, Caesar, CGI, Christopher Nolan, Dawn of the Planet of the Apes, Film, Fox, Gary Oldman, Jason Clarke, Keri Russell, Koba, Matt Reeves, Maurice, Michael Giacchino, review, Rise of the Planet of the Apes, Rocket, The Dark Knight, Toby Kebbell, Up. Bookmark the permalink. Great review! 🙂 I was hoping you’d write about it, as you were excited about the promos you shared earlier. I loved the movie, couldn’t agree more. I think what stood out to me (something you pointed out) was that everyone had justifiable reasons for taking the side they did. That, and as a sequel, it really referenced “Rise” well without trying to repeat it.